for Alachua County Teens, ages 13 - 17. Membership Benefits: Teens may use the centers for up to 2 hours per visit. Teen membership hours are below. Qualifying Age: Ages 13-17 with government issued I.D. (birth certificate, passport). Parental Consent: Must be enrolled by parent or legal guardian (legal guardianship requires proof). Parents do not have to be GHF members for their teens to participate. REGISTRATION: You may register your teen anytime during operating hours beginning May 29. Please complete the registration and waiver form below. Next, bring your teen and proof of age to any GHF location. You are also able to register after the program begins. Note: Teens may not use the Power of Friends Guest program while enrolled as a summer teen member. 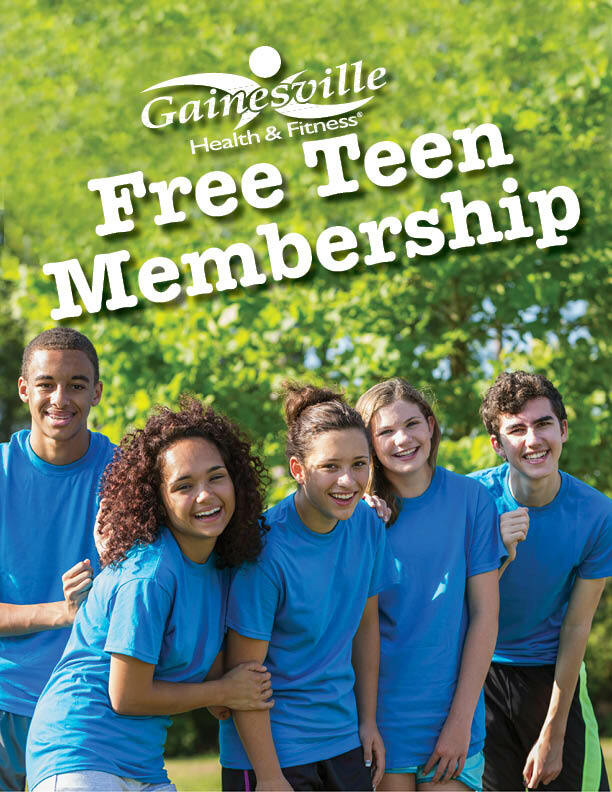 Free teen membership for ages 13-17 only. Membership duration is June 3-August 2, 2019; all teen memberships expire on August 2, 2019. Parent or legal guardian must enroll teen and provide proof of age (birth certificate, passport, government-issued I.D.). Siblings may not register siblings. Teen and parent must be present at registration. To maintain security, teen member must have photo in computer membership record. Photo and membership information will never be shared with outside parties. Teen member must show membership card at desk to enter club. Only one replacement card will be issued during program. Weekdays 6am-3pm at all locations. Last check-in is at 2:30pm. All workouts must be completed by 3pm weekdays to accommodate our members. Weekends 8am-6pm at Tioga & Women’s Club locations and 8am-10pm at Newberry Road location. Last check-in is 30 min. prior to close at each location. Teens may work out a maximum of 2 hours per day. Parent or guardian is solely responsible for transportation to and from GHF facilities. Teen members should respect our existing members and staff and practice standard GHF etiquette. Inappropriate behavior of any kind will not be tolerated. This membership may be revoked at any time for any reason by a GHF representative. GHF has the right to accept or not accept any applicant to this program at its discretion. Rules and guidelines governing the teen membership program are subject to change without notice. Use of facilities: It is expressly agreed that all exercise and treatments and use of all facilities shall be undertaken at the guest’s own risk, and the guest represents that he/she is physically able to undertake any and all physical exercise and treatments provided. Gainesville Health & Fitness Center, Inc. shall not be liable for any claims, demands, injuries, damages, actions or causes of action whatsoever to guest or property arising out of, or connected with, the use of any of the services and/or facilities. The guest does hereby expressly forever release and discharge the Gainesville Health & Fitness Center, Inc. and/or any of their affiliated companies from such claims, demands, injuries, damages, action, or causes of action, and from all acts of active of passive negligence on the part of such companies, corporations, clubs, their servants, agents, or employees. In the case of any accident, the guest agrees and concedes that he/she will be examined at his/her own expense, by a licensed physician who shall report in writing to both parties.